Equities and other markets can provide currency traders with a few useful clues about timing their trade entry and exits points. In particular, in some situations equities can identify when a currency pair is likely to be approaching major overbought or oversold levels. Traders can exploit these indicators to good effect to time entry into trend tops and bottoms. This is what’s called intermarket analysis. In this article, I will explain some of these ideas in more depth. Over the last 25 years, the major stock markets have shown tighter correlation to each other than at any other time in history. One cause is globalization. Many companies listed in the stock indices now have dependencies with foreign economies, and have worldwide earnings bases. The second reason of course is better information flow and investor access to financial markets. Rallying stocks usually mark a growing regional economy. This is typically positive for the currency as well. However, a number of factors often counterbalance this bullish effect. One of the most important is monetary policy. Lower interest rates and/or quantitative easing – often in place to stimulate economic growth – can act as a counterbalance weighing down on the currency too. Money flows are known to follow relative divergences in stock market performances. Also these flows tend to come afterwards, which means FX traders can anticipate changes in the currencies involved. One powerful influence that stocks exert over currencies is that rallying equity markets draw an inflow of real funds, both domestic as well as foreign. These come from foreign mutual fund managers as well as foreign private investors. They also pour in from domestic investors who will sell foreign assets to cash in on the booming markets at home. These fund flows, driven primarily by “chasing returns”, create a prevailing downward or upward pressure on exchange rates. These flows always start for good fundamentals reasons. In the later stages of a rally, the fundamentals are less credible but technicals take over. In particular, there is often an overshoot both on the upside, as well as the downside where the market’s fair value is stretched. It is these timing points that FX position traders try to identify because they often signify long-term trend reversals in the currency pair too. Some currencies have an inverse relationship to their domestic stock markets, historically the US Dollar, and to some extent the Japanese Yen. Not only that, the influence can work both ways. For example, in export dominated economies, a weaker currency may boost the stock market. A falling exchange rate makes exports more competitive, which is good for businesses selling goods to the rest of the world. This is the case in Japan for example. However, since these relationships tend to be fixed over time, divergence measures can be used for any currency pair. Let’s look at a real example. 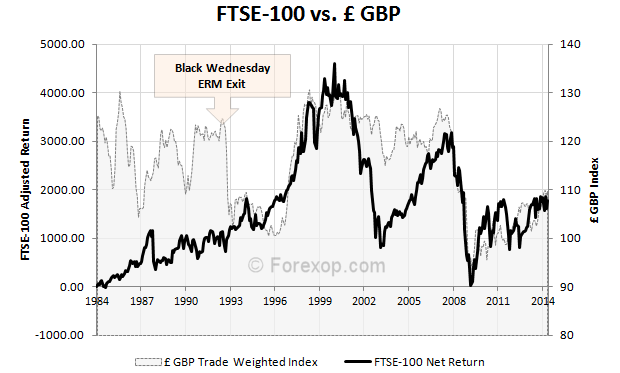 The first chart below shows the return on the FTSE-100 relative to the long-term average return on that stock index. This is shown against the British Pound currency’s trade weighted index. The second chart shows the same data for the NIKKEI-225 versus the Japanese Yen. Funds leave a market when it is delivering below average returns. These asset flows are known to take place with most kinds of mutual funds when they are out performing or under performing. In other words, investors perpetually chase the top performing asset class. In the case of equities, these fund flows can be significant. At the time of writing, the market cap of the FTSE-100 for example is £1.8 trillion. The market cap of the NIKKEI-225 is $4.5 trillion (¥463 trillion). If we look at the NIKKEI-225, there are two prominent cycles. 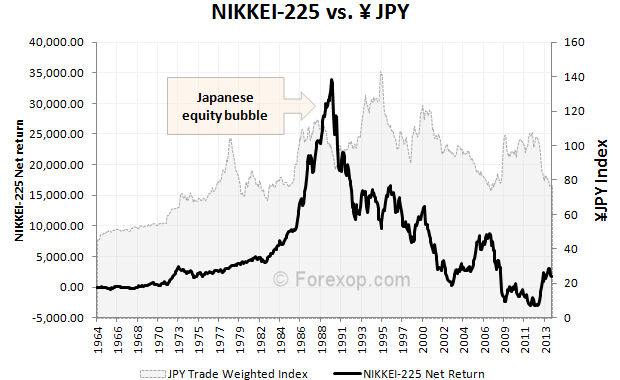 In the long term, the value of the Yen and the returns on NIKKEI track one another. While the short-term affect is the opposite. The Yen strengthens when investors anticipate stocks falling. This is most probably because of tactical defensive positioning. 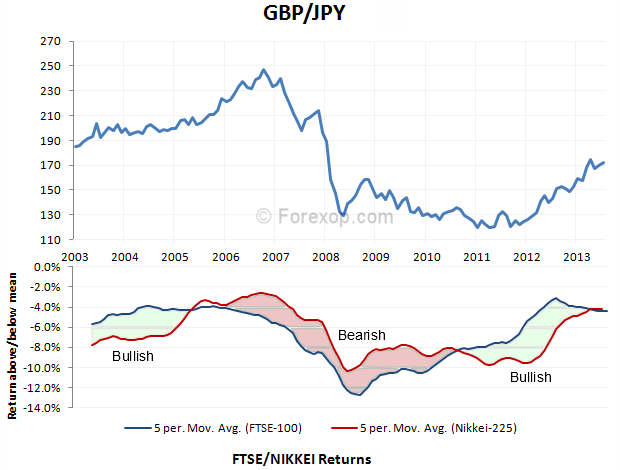 The chart below summarizes the above idea, showing the relationship to the pair GBP/JPY. The indicator line of the chart shows the out performance/under performance of the stock indices relative to each other. These show the difference between the long-term return on the index and the 72-month rolling return. Note that the crossovers mark the start of major trend reversals in the currency pair. The currencies do not typically track the indices directly. What this shows is that GBP/JPY strengthens when the NIKKEI is outperforming, and weakens when the FTSE is outperforming. But this only becomes clear when you look at the divergence from average returns. If you look directly at the stock markets, the relationship is far from clear. When the indicator’s moving average is increased, to 36-months, the bigger trends and the relationship become more clear. But taking a longer moving average does result in delayed timing of tops and bottoms. The table below shows how the indicator is calculated. For each index, a long-term rolling return and a short term-rolling return is calculated. In the example, these are 72-month and 12-month rolling returns calculated as a monthly average. In July for example, the FTSE monthly average return over the previous 72-months was 0.3%, while the return over 12-months was 0.14%. The difference then gives a measure of short term relative performance for the FTSE. The difference between the relative performance for the two indices provides the indicator. For the example month, this was -1.26%. Taking a moving average then smooths any noise in the monthly returns and provides a more stable measure. Date FTSE 72m 12m Diff Eurostoxx 72m 12m Diff Indicator M.A. The chart for this example is shown below. This is useful in identifying the start and end of long-term cycles, and trends in currency pairs. Whichever pair you are trading, it is important to understand how each currency reacts to changes in the appropriate stock index. Keep in mind that all currencies behave slightly differently with respect to this. Some currencies may weaken when the domestic stock market rises, and others may strengthen. The relationship however is usually static, so that the indicator can provide a reliable signal. Further examples are shown below. Stocks and currencies do not track each other in an obvious way when you look at the markets directly. Nevertheless, hidden within the data, there are identifiable relationships that FX traders can exploit to their advantage. The divergence indicator explained here can be used to predict the reversal points of major trends in currency pairs. This is because large fund flows are known to follow changes in stock performance. The currencies more often behave in the same way with respect to these divergences. This can be helpful when used alongside other indicators in identifying points at which to enter and exit the market. 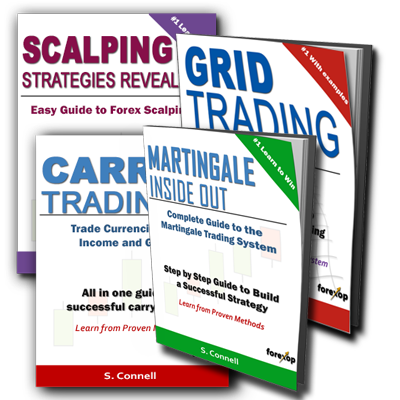 We also have Metatrader cross market indicator that can examine relationships between any markets. It would do this if there are non numeric cells in the data input sheet. Please check all input data is properly cleaned and doesn’t contains spaces or non numbers. Excel is very fussy about cell formats. If you copy from another sheet it can be pasting them in as text cells and not numbers even if they display as numbers. This will cause them to give errors on the calculation. To alert you, I downloaded the excel sheet and it prompts for a password before it can be used. Prob. some protected cells or author accidentally protected the whole workbook. The prompt appears when you paste too many cells into a range and they would go into protected cells. You can only put data into the boxes, that’s the reason for this message. Very useful tool for spotting trends. I have attempted to draw this graph myself but must be misunderstanding the plot data. Are you able to provide details of where the relevant data can be found so that I can draw these graphs?Or an excel file showing the data together with the graphs as they look like they have been drawn in excel above?. This data was actually from Yahoo finance. For the FTSE, you can grab it from there: uk.finance.yahoo.com/q/hp?s=^FTSE. There’s a bunch of other websites where you can download index data, depending on which one you need. For the chart, the one with overbought/oversold signals you just need data for the two stock indices you are comparing. The chart shows periods of above/below average returns plotted on each index. So for that you need to use Excel to find the long-term average return over the period you are looking at. The difference then is what gets plotted on the chart. I will put the example Excel sheet on our downloads page pretty soon once its tidied up.